Not too long ago we showed you a teaser trailer and the gameplay details for Scavengers Studio’s upcoming survival battle royale, The Darwin Project. Recently, we had a chance to play the game’s Closed Alpha and are excited to share our experience. Set in a post-apocalyptic dystopian future, The Darwin Project is a live-action entertainment experiment similar to Running Man or The Hunger Games. 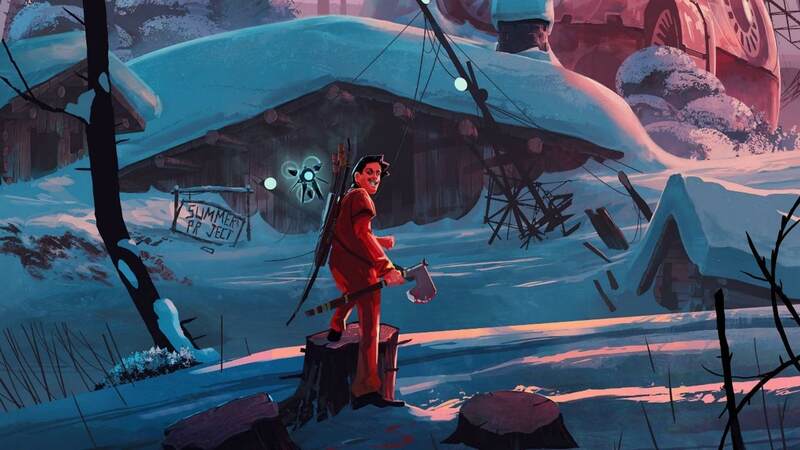 The game’s homepage tells us that The Darwin Project is located in the Northern Canadian Rockies, and as preparation for an impending Ice Age, this project/science experiment challenges participants to survive the frigid temperatures and fight to the death. This is truly a Darwinian survival of the fittest. The gameplay field is a large hexagonal map composed of seven smaller hexagons. 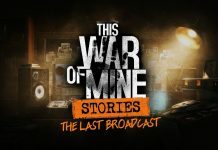 Seven players spawn into their own areas spread out across the map wherein they must start collecting the tools for survival, both against the elements and each other. Currently, The Darwin Project has three main resources: wood, leather, and electronics. Armed with an axe for both chopping and battle, the player gathers wood by cutting down special highlighted trees. Each player will be given a bow for both hunting and ranged battle; leather can be harvested from deer found around the map, and somewhat hilariously, leather armchairs that spawn not only in cabins, but also out in the wild. Electronics are a rare resource that spawn at timed intervals around the entire map. Immediately before spawning, there is a large bright field that forms around the spawn location and shrinks down, ending in a beam of light shooting up into the sky with a spoken announcement that electronics has spawned. Unlike other resources, electronics are visible on the map. A beacon for the electronics resource. The Darwin Project’s crafting system is rather straightforward and simple. Wood and leather are used in various combinations to craft and upgrade coats, boots, armour, traps, turrets, and your axe. Each upgrade increases things like cold resistance, movement speed, and damage dealt. Camp Fires are also craftable for warmth. Each player starts with an axe and a bow, but no arrows, (they must be crafted). You’ll need to decide which is most important: cold protection, speed, arrows, etc.. The rarer electronics are required for premium reusable gear: teleportation, camouflage, shield, and revealing player and resource locations. Only one electronics resource is needed for each of these items. While the entire play area is snow covered and frigid, there are different “biomes” or themes around the map. One area has cabins and a stream, another has dilapidated and run down buildings, while yet another is spread out across a cliff. The centre contains an open, frozen pond. This experience was quite welcome as a way to break up the scenery and actually required varying tactics. When playing survival games, my favourite biome tends to be the snowy/frozen areas, and this one was a beauty. 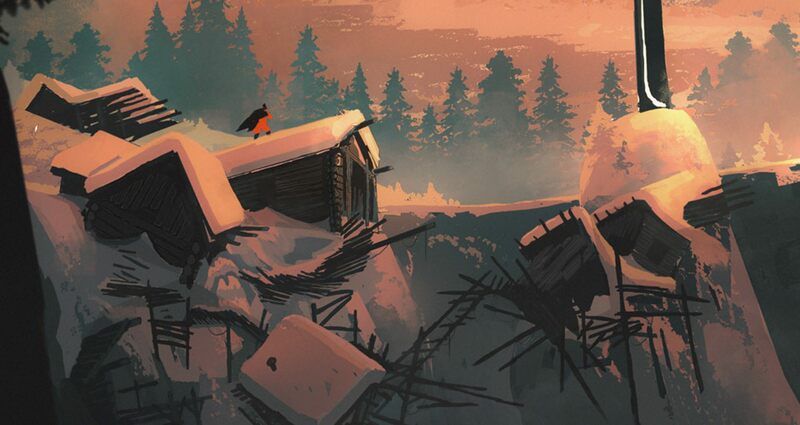 The Darwin Project’s snow covered trees and frozen streams and ponds help build a sense of isolation in the beginning. The flickering light and smoke from the camp fire casts a warm glow on the surrounding icy landscape. The sound was great as well, with axes thunking convincingly into trees and snow crunching underfoot. Perhaps my one complaint about the sound would be that the noise made when electronics spawn was equally as loud as when it spawned nearby or on the other side of the map. Not a big deal, but I often expected it to be right behind me when it was actually two areas away. You can almost feel the bitter cold. 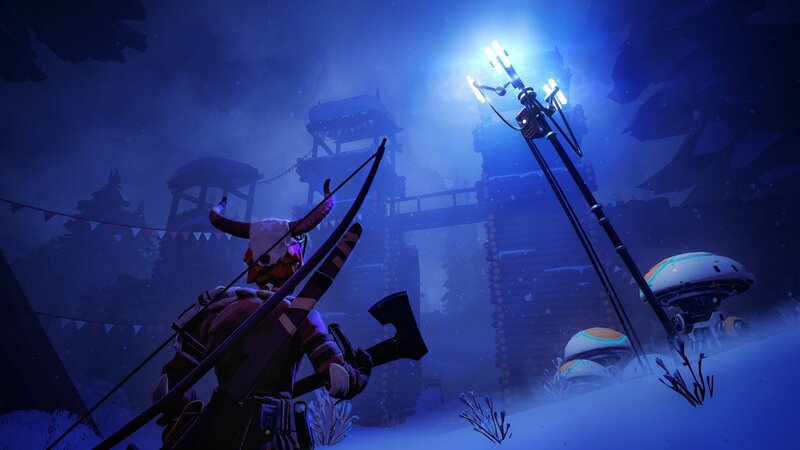 The Darwin Project is a hybrid of resource gathering, crafting, and PvP. How well the player gathers and handles resources greatly enhances the chance of success against the other players since everybody starts with the same equipment. The crafting system isn’t as deep as it would be in a Survival game, but that’s a good thing here. The radial crafting menu is easily accessed and there is no need to unlock additional recipes. There isn’t time for that. The pressure of time means that the gameplay isn’t divided into a “crafting” section followed by a “PvP” section. Even as the playing field shrinks and you are hunting or avoiding other players, it is necessary to constantly keep gathering and crafting. As the game progresses, the daylight fades to night and visibility lessens. Despite this, there are a variety of ways to detect other players. The continuous gathering can come with a downside. The thwack of the axe on a tree carries a fair distance, alerting other players to your presence. Additionally, this sound can produce a visible ripple that shows where the sound is coming from. Some of the buildings even contain maps that show the locations of the other players, so be prepared! 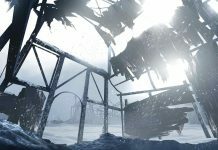 There are other survival elements that effect gameplay as well. Players have a “cold meter” that shows your level of warmth. 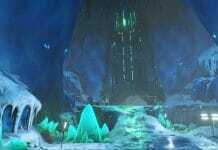 Reach the lowest level and you’ll quickly start freezing to death. You can insulate against the cold by crafting and upgrading your coat, or you can build a fire that will quickly refill your heat bar. However, the warm glow and pillar of smoke from your fire can act as a beacon visible from a distance. Many times you’ll pop a quick camp fire, heat up, then beat a hasty retreat before anybody else looks for you. Maybe the aftermath of an avalanche? 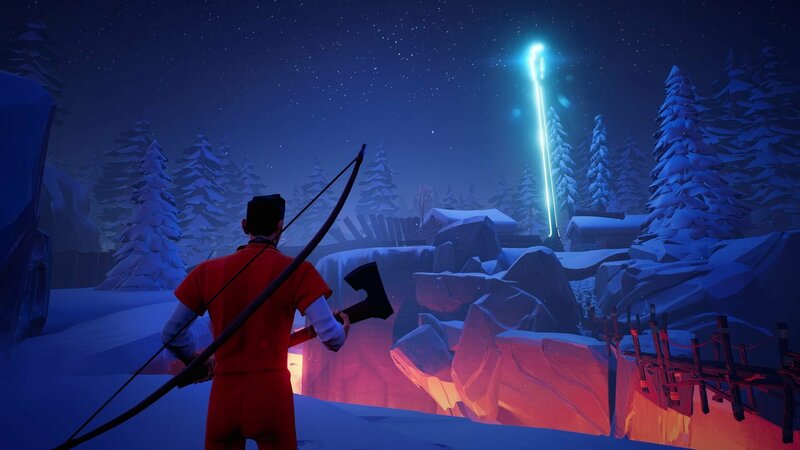 The Darwin Project’s snow isn’t just a pretty atmospheric background. It can also betray your location. Looking down from a small cliff, I could see glistening white footprints in the snow, showing that somebody was nearby. A somebody that then killed me pretty quickly. Since everybody has the same weaponry, the only difference between players is the amount of upgrading they do to their equipment. Some might buff up their axe, while others focus on their bow. Most, if not all, of the combat occurs in close proximity to other players. The bow only shoots so far, and the axe is, of course, a hand-to-hand weapon. The other weapons available by crafting are: a bear trap and an arrow turret. Here’s how my typical game went. Spawn into a frozen area and head to the first outlined tree I see and start chopping. Players are initially spread out and focused on their own gathering, so there is no need to worry about sound. From there, I would quickly scramble around looking for trees, armchairs, deer, and buildings to harvest and gather from. After crafting a coat and some arrows, I would continue gathering until the map started to shrink. What I always seemed to forget to make was armour, so learn from my mistakes! I’m not a strong PvPer, so I tended to gather and avoid other players for as long as possible. But then, eventually each of the seven areas would shut down one-by-one, and I couldn’t avoid it any longer. Another aspect to the PvP was the forming of alliances. Players can throw down a flag/banner in front of another player, and if picked up, an alliance is formed. A team of allied players are difficult to beat. If the last two remaining players are in an alliance, it appears that the game automatically breaks the alliance and a fight to the death ensues. The first time I joined a game, I was too late and became a spectator. I wasn’t quite familiar with how to play, so I floated around watching other players. At times I could hear a player say “Is someone watching me?”. It wasn’t until I was able to join properly that I realised why. Since the premise of the game is that this is a type of spectator sport, the spectators are actually floating drones visible to the combatants. As I watched the game progress, I noticed that the players who lasted the longest tended to be the ones who gathered the most materials. As a spectator, you can see each of the upgrades the players have. Some would have two or three of the electronic based upgrades. As stated before, these allowed special abilities that were reusable after a cooldown. 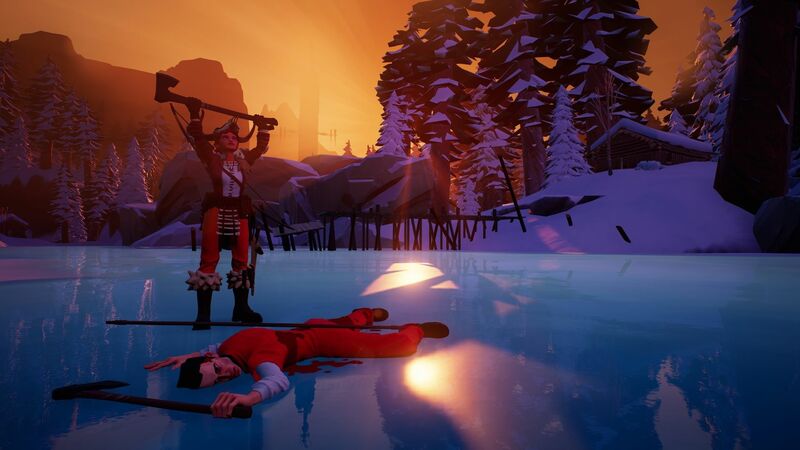 I thoroughly enjoyed my time with The Darwin Project‘s alpha. The survival and crafting elements are a fun and different addition to the battle royale genre, and are necessary to a winning strategy. Additionally, the game looked great and ran without a hiccup on my slowly aging computer. We here at Survivethis are excited to watch and see how the game develops through Alpha and beyond. We’ll post more information as it becomes available. 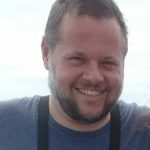 This article was based on a Closed Alpha version of The Darwin Project, which is in active development. Features described above may be different or absent in the final product.